Hubert John Williams (1905-1989). 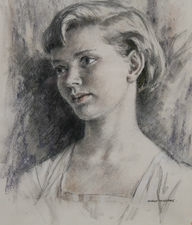 Portrait, landscape and architectural painter, etcher and illustrator, Williams was born in Kent in 1905. He studied at the Royal Academy Schools where he was awarded the Landseer Scholarship for 1928. He also attended the St Martins School of Art and the L.C.C. Schools. He exhibited between 1926 and 1939 at the Royal Academy, the Royal Scottish Academy, the Royal Institute of Painters in Oil, the New English Art Club amongst others. He was a Member of the Pastel Group and the Society of Graphic Artists. Collections can be found at the Imperial War Museum, Museum of London, Ferens Art Gallery, Hull, Southampton Art Gallery, Towner Art Gallery, Eastbourne and Bath.